During the summer the A-Building has been home to an urban agriculture project following an initiative from doctoral student Ida Åberg. 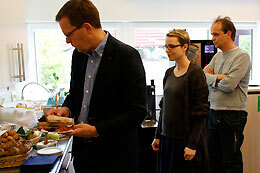 The pilot project has now concluded with a harvest festival with food from the garden. 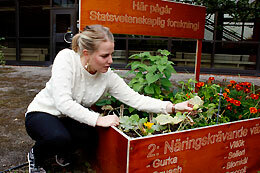 Ida Åberg is a doctoral student in political science and is looking at urban agriculture from a political perspective. But she wanted to test the idea in practice. With donated plants and soil, and cultivation boxes built at LiU, she obtained approval from the property owner and started growing crops. A rented beehive has also contributed. The project has, however, worked so well that the harvest was more than enough for a “divine” lunch, as one of the around 20 guests expressed it. The menu consisted of potato and leek soup, zucchini bread, horseradish paste, honey, green tomato marmalade, beetroot marmalade and pesto from sun-dried tomatoes. All of the raw materials came from Ida’s plaot in the A-Building or from her own allotment, and only a few dairy products were purchased. One of those who have been inspired is Natasha Bank, doctoral student in entrepreneurship.